This driver is the first to support the newly launched 8th Gen Intel® Core™ Desktop Processor Family. Start your engines! Intel® is proud to announce that the world’s most popular and widely played sports racing series is now playable† on Intel HD Graphics 620 or better for the first time ever, with the latest instalment: Forza Motorsport 7*†, through graphics memory allocation improvements. From finish lines to free kicks, enjoy electrifying action at launch of the latest games, Forza Motorsport 7*†, Project CARS 2*, Guild Wars 2: Path of Fire*, FIFA 18*, EVE: Valkyrie Warzone*, Danganronpa V3: Killing Harmony*, and Hob* on processors with Intel® HD Graphics 620 or better. Battle space demons as you explore beautiful lands on the latest titles like The Wild Eight* and Raiders of the Broken Planet – Alien Myths Campaign* on Intel® Iris® Pro Graphics. 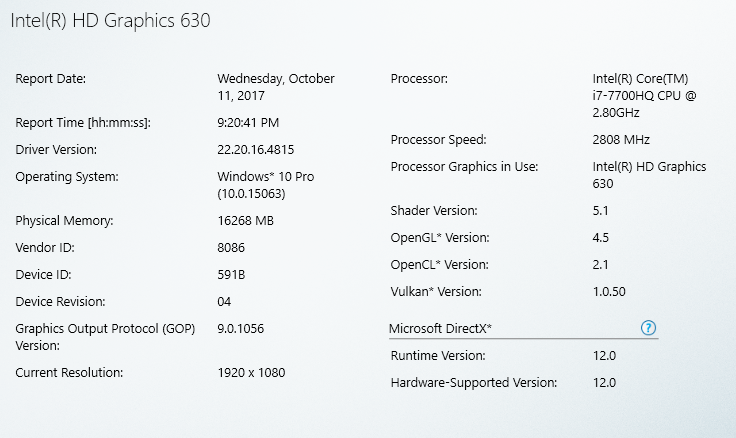 I installed v4815 on my notebook (GeForce GTX 1050 + Intel HD 630). Here is the OpenGL/Vulkan information. 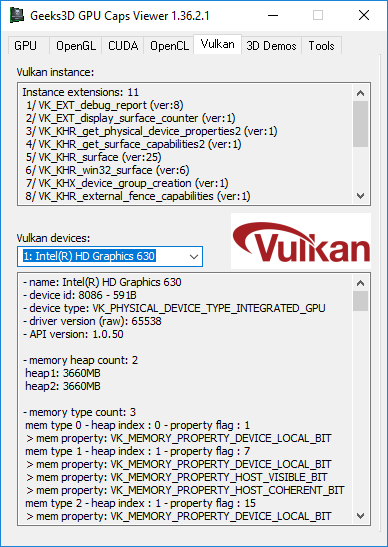 Intel 23.20.16.4849 driver, Vulkan 1.0.61 support.